The prompt, "Let's make Windows even better -- this should not affect what you've already set up", is displayed in recent Insider Builds of Windows 10. The prompt is completely optional at the time; users may hit the "skip for now" link to skip it and continue to the Windows desktop. 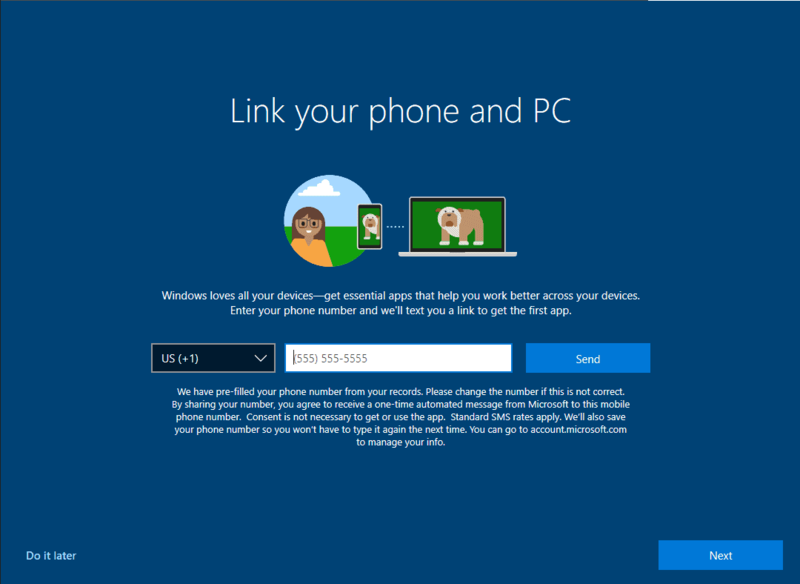 Considering that these services require a Microsoft account, it is possible that users who sign in with a local account don't get to see the prompt. Reminds me of a new slogan Philips Electronics came up with in the 1990s: “Let’s make things better.” In the media someone made a variaton on this: “Let’s make better things.” Could a similar variation be applicable to Windows too? Just self promotion for Microsoft spyware and other nefarious crap. Microsoft has no shame. They want to spread dependence on Microsoft “services” to other platforms. Then once they have people dependent they will start charging subscriptions for what used to be free. Besides all that, they spy on users the same as Google. No, this prompt is not useful for me, as I am not and will not use any of these 5 options. For other people, that work intensively with MS it might be useful, but only if it pops up once only ; when it would pop-up every time it will be irritating. I’d like to point on wording used in bottom left corner – “Skip for now” (and “Do it later” on linking phone and computer). It’s not “Skip” neither “No” or “Don’t ask again”, so we can assume that Windows will periodically nag users with this window again until it surrenders and agrees for this “integration”. Same thing happens on facebook and elsewhere – corporations and companies doesn’t offer or accept the definite refusal and then, whenever something happens, they’re going with innocent statement “but user/customer agreed for this” – yeah, because you didn’t provided the real choice. Thirdly its the slow and subtle attempt to migrate users from controlling their own data with some modicum of privacy to having Microsoft handle it all for you. Gee! How convenient! This transition, wrapped in its cutesy and friendly packaging is somewhat inexpensive now but the subscriptions for more access, storage space, encryption, compatibility….will eventually come. Then, there will be the day you didn’t pay your fee for whatever the reason and all that convenient data will be locked up and inaccessible. But hey! At least it’ll be safely backed up somewhere out there for you! Microsoft and its “partners” may have a little peek from time to time purely for enhancing and improving the users experience. See! Its all for you!! The 1809 update just dropped in yesterday only to find out that Windows “again” did reset quite a bit of my personal settings (personal fonts replaced with Windows standard fonts again, ugly arrows and UAC shields on top of my desktop icons covering them for 50% again, spotlight that doesn’t work anymore, etc etc). Minor things but frustrating that i have to do my setup all over again. So i ain’t waiting for 1903…no sir. I’d love to make Windows better. Unfortunately, only Microsoft can do that and they apparently don’t want to. This gave me a good laugh. Thank you! I’m on 1903 and never seen this, however I upgraded to 1903 using wsus before it was pulled so that may matter. grr I said 1903 yet was 1809 on my end. disregard my last comment when it shows up as is false. This’ll just make it easier for the surveillance state that we’ve constructed here in the US to accurately track you across devices and for Microsoft to more accurately target you with tailored advertisements. Great comment, listing primary sources adds great weight and validity. Xkeyscore. a program used by the NSA. Another Spy-program is: ECHELON. and MUSCULAR. Many spy-programs are still classified. Just be aware: if you type it into the internet it is stored by the government and data mined by corporations. Read/Watch the: Report from Iron Mountain. Also: Operation Paperclip. Remember that Microsoft want to build a One huge private data data base ? They are nuts. Gloryfying crap does not turn it into gold. wumt and wpd sure make life alot easier, thanks to here for clueing me in about these 2 gems. It may as well say “Let’s send Windows to Uranus!” for the utility this nag screen provides. The upcoming 19H1 is useless since RDP/Enhanced Session Mode no longer works due to terminal service crashing permanently. Emphasis is on the word 𝙨𝙝𝙤𝙪𝙡𝙙 here people. 𝘼𝙛𝙩𝙚𝙧 𝙖𝙡𝙡, 𝙩𝙝𝙞𝙨 𝙞𝙨 𝙈𝙞𝙘𝙧𝙤𝙨𝙤𝙛𝙩. Windows 10 OS should work properly without causing undue stress on users. From much past experience, they actually mean 𝙘𝙤𝙪𝙡𝙙 when they say should. To make it better would be not to upgrade. At least for myself, because I suspect by the time 1903 rolls out 1809 might actually be stable. I certainly won’t be using a Microsoft account ever, because local account works just fine and I could care less about what options I loose. Other then needing Windows, I don’t need Microsoft anymore. The “even” shouldn’t be there, because it hasn’t been good for years. 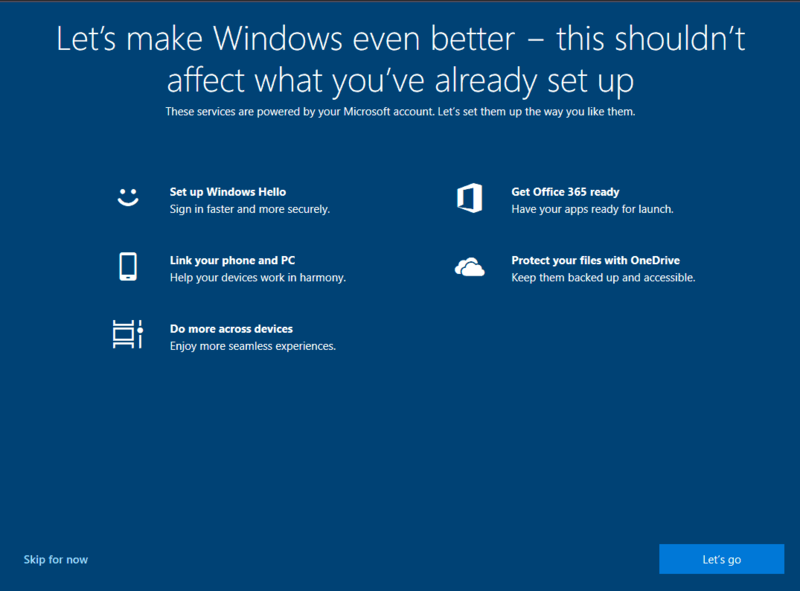 If anything they should say “Let’s try to make Windows better” or “Let’s try to make Windows good again”. Emphasis on the “try” because they can only try (and most likely keep failing). I literally don’t trust anything that Microsoft says anymore. Anything. In my opinion, they are destroying the computing experience. Please gives us your data. We are greedy and the money you sent to buy a windows license is not enough. We want more money out of you. Microsoft proving once again they just don’t get it. The big blue button should read “skip forever”. Nothing in that window is how or what I use a computer for. I would pay a thousand euros for a Windows that has a file browser and nothing else. With the option to install my own choice of web browser, music player, videoplayer and so on. No printing capabilities, no remote access stuff, no goddamn anything! ONE service running, the file browser. Windows superlite. Let me decide what I want to add. Throw everything you have now away. Burn it in hellfire. Windows 10 better ? Hahahahaha…………todays joke ! Link your phone with your PC, so we can track very well what you do on your machine, and eventually we can inform three-letters-agencies surveillance about your strange activities and tastes on internet. Its appearance has become more & more innocent,colorful & child like? How do sane people ignore the noose being placed around their necks? @supergirl: Microsoft has been insidious sinister & pernicious for decades. I don’t think they’ve become worse, really. The difference is that Microsoft had more recently embarked on a PR campaign to try to convince everyone that they’ve changed their stripes, and the campaign was reasonably effective with people who are too young to have experienced the awful behavior of Microsoft in their heyday. However, they couldn’t keep up the “good guy” act and even those people are noticing that no stripes have actually been changed. Link Phone and PC, feature already existing in Whatsapp, is a very good idea.